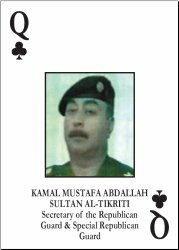 General Kamal Mustafa Abdallah Sultan Al-Tikriti was the Secretary General of the Republican Guard under Saddam Hussein's Regime. He was also a member of the regime's inner circle. He surrendered to Coalition Forces in Baghdad, in the morning of May 17, 2003.